Aims to draw attention to the use of combined movements when examining and treating mechanical disorders of the vertebral column. It is intended that this manual is used in conjunction with the more complete texts of Maitland (1986) and Grieve (1988). 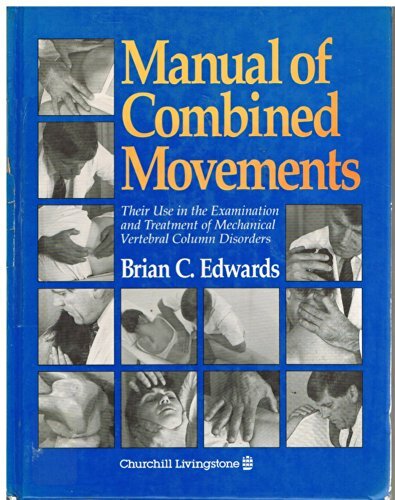 The purpose of this manual is simply to draw attention to the use of combined movements when examining and treating mechanical disorders of the vertebral column. It is intended that the manual be used in conjunction with the more complete texts of Maitland (1986) and Grieve (1988). The principles of technique selection in relation to movement pattern and category of patient i.e. acute, subacute and chronic have been suggested with the intention of providing a basis for the choice of initial direction. The rationale has then been expanded to incorporate a progression of treatment related to direction of movement and position of joint, rather than grade of movement; however, an understanding of the parinciples of the graded movement are essential to the total concept. Generally, it is hoped that the concept and use of combined movements will be seen to be a helpful and simple adjunct to the management of vertebral column disorders of mechanical origin.